Picking out the best digital camera from the massive selection on offer can be intimidating. So it's easy to understand why well-known, market leading brands such as Nikon have such a die-hard following. While nobody doubts the quality of Nikon's optics, the meagre 1.5-inch screens on the CoolPix range (the smallest available on any compact) has been a source of frustration for reviewers and buyers. So we're glad to report that the 5900 finally sports a screen to shout about. The new two-inch display brings the CoolPix bang up to date. The innovation doesn't end there though, as the 5900 also incorporates a number of new features such as 'face priority' autofocus and 'dynamic lighting', both designed to make point-and-shoot photography even easier and more rewarding. Face priority will obviously be a big help to portrait photographers. The CoolPix 5900 was announced at the same time as its more powerful 7.1 megapixel sibling, the 7900, but what makes the 5900 unique is that it's available exclusively through Jessops. The overall design of the 5900 remains the same as many of Nikon's compacts of recent years, with a grip on the left-hand side and the mode dial easily accessible on the top. The majority of the body is constructed from metal, giving the camera a solid, reliable feel. One disappointment is the tripod mount, which isn't central to the lens and is made from plastic. The larger screen has meant the back of the camera has had to be re-designed, and while the controls have been squeezed together, the operation remains the same. Whether you're a fan of them or not, the CoolPix range continue to offer an optical viewfinder. Concealed within the menu is the option to disable the larger screen to further extend the battery life; not that you should need to, however, as the 1,100mAh Lithiumion cell claims an impressive 220 images on a single charge. Another reason to keep your screen turned on is the fact that the sizeable display offers an impressive 100 per cent image, compared to the disappointing 75 per cent coverage of the viewfinder. Nikon has cleverly removed one of the last stumbling blocks of Lithium-ion batteries by offering a 100 to 240 volt worldwide battery charger, and by making the camera compatible with the single use CP1 Lithium batteries, ideal for anyone going off the beaten track. The only obvious improvement that Nikon could make here is a better battery life indicator, as the current one only shows when you're almost out of juice (typically miles from a power supply). At first glance, the other connectivity options look limited, but closer examination reveals that Nikon has combined the function of the USB and A/V sockets into one port. You still need to keep track of two cables, but it does mean the sockets are easier to protect on the camera body. On the opposing side to the USB port is a similarly sized rubber stopper, which can be removed to connect the camera directly to the mains, via a modified battery. Rather than simply tacking on new features to an aging model, the CoolPix 5900 feels entirely new, and much faster to use. This leap in performance is underscored by the threesecond start-up, minimal shutter lag and faster menu navigation, but the most obvious additions are the new image overlays. For example, selecting 'portrait' mode gives you the choice of seven different focal modes. The first sticks with tradition by enabling you to compose your image, focus and click. The rest actually draw a variety of translucent images of a person or persons on the screen, and let you move your subject into that guide, helping you get perfect focus and better composition into the bargain. A bit belt and braces, perhaps, but it works well, and will certainly help novices. The last mode, 'face priority,' was developed in conjunction with biometrics specialist Identix, and actually scans the frame in real time, looking for the distinctive pattern and features of a human face. Once the software finds its target, a red box is drawn around the subject, which constantly tracks the movement of that person's face, only losing it when they turn away from the camera. It's impressive to see this technology in practice, but the speed leaves a little bit to be desired - subjects need to pose for some time while the camera wakes up and is ready, so this won't be ideal with children. Reading the specifications may lead you to believe that the 5900 can focus manually, but describing it as manual focus would be stretching the truth. In reality the camera only allows you to manually select the point of autofocus from a grid. With enough light, the sports mode is very useful. The CoolPix automatically switches from single shot and focus, to burst mode with continuous focus. This allows you to easily track movement and fire off two frames per second, until the buffer of 17 shots is full or your battery is exhausted - which ever comes first. There's also a 'sports spectator' mode, which fixes the focal length to infinity and cuts the time to take a picture. On the plus side, this 13.5Mb of internal storage means that when you slot in your SD card, this memory can be combined to it. The fact remains however, that this meagre amount of storage can only record five images at the camera's best-quality setting, making the additional purchase of an SD card essential. Power up the camera and the LCD will greet you with an attractive animated logo, followed by Nikon's updated user interface. There's a lot going on in the menu, which spans over three screens and offers settings for white balance, light metering and autofocus among other things. Finding your way round the CoolPix can be somewhat daunting at first, but once you begin to familiarise yourself with the logic behind its workings you uncover some useful functions. These features include the ability to crop your images in the camera, re-sample the entire frame down to a lower resolution, or tag audio clips on as narration. Among the wealth of options, the menu itself can be tweaked to allow the choice of either text or icons. Unfortunately, there's no provision for simplifying the vast range of features while you learn the ropes. Drawing on literally decades of experience in photography, the Zoom Nikkor ED lens of the 5900 is of a predictably high standard. Unlike Canon's newer 4x models, the CoolPix cameras continue to offer a 3x optical zoom, covering an equivalent of 38-114mm. The coated lens provides a respectable maximum aperture of f2.8 at the wide-angle setting, dropping to a less impressive f4.8 at the full extent of the zoom. Testing the Nikkor lens for any distortion, the telephoto end was almost completely free from any problems; that said, there was a fair amount of barrelling at the 5900's widest setting. Nikon has been striving to improve the results from simple digital point-and-shoot cameras for some time now, with innovations such as in-camera red-eye removal. This technology runs alongside the conventional pre-flash bursts, which work by shrinking your iris, and instead it scans the photos to detect any red-eye, then saves the image if required, without the unsightly effect. Another useful tool in the camera's considerable repertoire is D-Lighting, similar to the technology first seen in the groundbreaking HP R707. D-Lighting - otherwise known as adaptive or dynamic lighting - works after you've taken a picture and allows images with excessively dark areas to be lightened up without over-exposing the brighter elements of the scene. The technology may be complex but it's very simple to use, and often restores disappointing images by literally bringing the subjects' faces out of the shadows. As with many of the higher megapixel cameras, the 5900 uses a noise-reduction mode to capture night shots. This additional filter helps prevent unwanted graininess in longer exposures or when using higher ISO speeds. By default, the noise reduction is disabled for all other modes but can be activated if required. 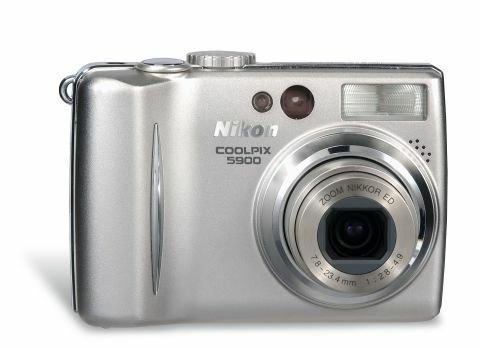 Comparing the Nikon to similar models, the larger Canon A95 Powershot hovers around the same price point, offers a similar zoom, comparable megapixels and while the 1.8- inch screen is fractionally smaller, it can be flipped out and rotated round. The Nikon's main difference lies in its lack of manual settings such as aperture and shutter priority, favouring instead a barrage of widgets that make a beginner's life a lot easier, but potentially frustrate an experimenting enthusiast. That said, one major strength of the Nikon package is the accompanying software, which includes Picture Project 1.1, FotoShare and Arcsoft Panorama 3. This suite of software enables you to catalogue, create video slideshows and even publish your images onto secure websites for distant family members to enjoy. The inclusion of Arcsoft Panorama 3 is particularly interesting, as it makes the process of stitching together images to create a panorama impressively easy. Returning to the image quality, the results from the Nikon CoolPix were slightly better than expected, with very accurate colours and beautiful skin tones. Outdoors, the Nikkor ED optics performed superbly, producing intricate images with fantastically sharp detail. Indoors, the metering system worked hand-in-hand with the flash and the focus-assist lamp to ensure the compact hit the mark and didn't wash out the snaps.